This resource is PACKED with tons of activities for your classroom! 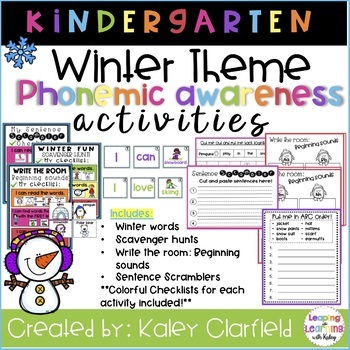 I’ve focused on Phonemic Awareness activities through a Winter them. Winter Themed words- tons of words for winter that you can: hang up on your word wall, put around the classroom (for the scavenger hunt) or use them in your writing center). Scavenger hunts- Kids LOVE getting involved in their learning. These scavenger hunts are either- Winter sports, Winter fun or Winter clothing. Write the room: Beginning sounds- Perfect for beginning Phonemic Awareness activities! Sentence Scramblers- I have created multiple sentences that you can cut + laminate. Students must read the words and put the sentences back together in order to make sense. There are follow up activities as well, where students cut out the words themselves and put them in the right sentence. ***Added bonus! Colorful, Checklists that explain each activity in a “kid-friendly” way. These are perfect for printing and putting up in your classroom for students to use while working.